Molino Vigevano gluten-free flour blends are the result of a careful selection of high-quality raw materials, and are the products of their kind to contain corn germ. They are manufactured with the guarantee of a leading brand and the know-how of our R & D laboratory, in a certified, guaranteed production plant. Corn starch, corn germ, rice flour, soy protein, vegetable fibre, potato starch, sourdough buckwheat, thickeners: E464, E460, E412, sugar, salt. 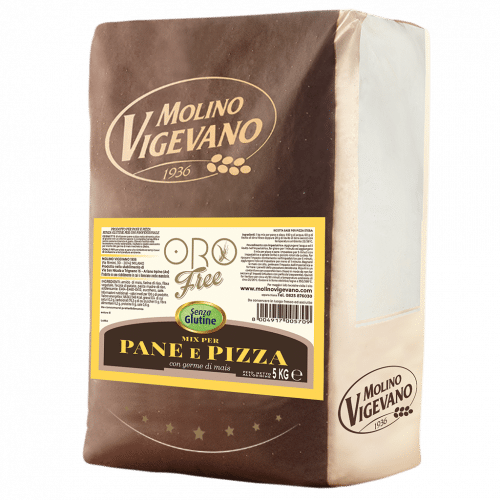 The Molino Vigevano Mix for pan pizza and bread is produced with naturally gluten-free raw materials and sourdough. Easy to use, it guarantees a pizza with a good honeycomb, soft, light and with a taste comparable to that of a pizza made using soft wheat flour. It lends itself perfectly to plate prepared pizzas, without risk of “tears”. Ideal also for bread, it guarantees excellent results without compromising on flavour. The Mix for pan pizza and bread is ideal for daytime leavening from 3 to 6 hours at room temperature; it can be matured for 24 hours in a refrigeration cell at 6 ° C. Available in 5kg bags. The product is manufactured in an environment where milk, mile derivatives and lupine beans are also processed.